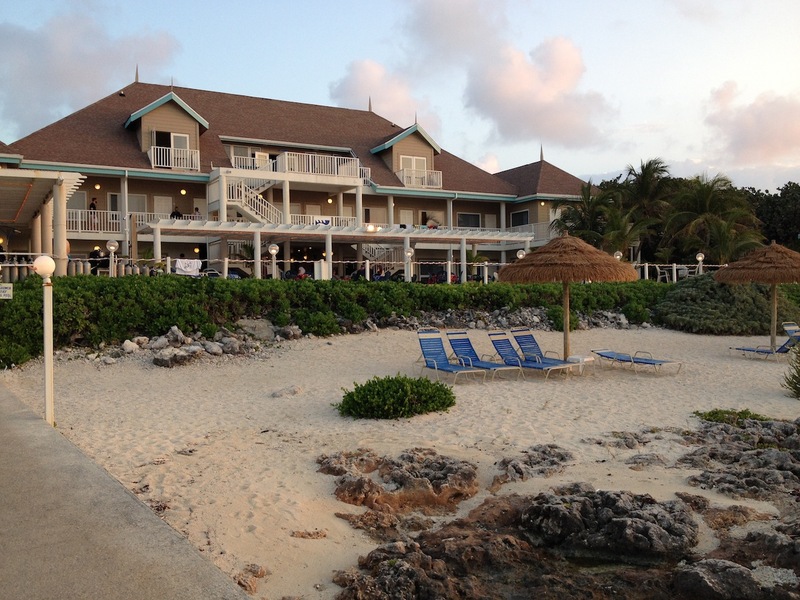 Creating an Eco-lodge for Divers on Grand Cayman: Arie Barendrecht Knows How to Do It. Arie Barendrecht has agreed to talk to me about what it takes to run his popular dive lodge, the Cobalt Coast on Grand Cayman, as a Green Globe certified ecolodge. 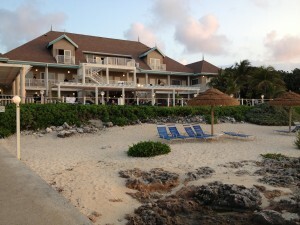 We sit in the shady breezeway of the lodge, perched on the iron shore of West Bay as the sun glistens on the sea. The Dutch-born owner with the piercing blue eyes pats the large three-ringed binder on the table. “This is my green book,” he says. The over-stuffed binder is filled with receipts, documentation, calculations, and all his notes about what he’s done to, what we might call—go green. After all, he’s been on the cutting-edge of earth-friendly initiatives on the island for years. He started recycling, using non-disposables, cutting energy use, and saving water long before others ever uttered the words, sustainable travel. We just get chatting and he jumps up to bid a guest a safe trip home and help load luggage into a van. 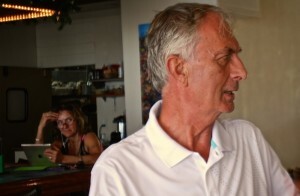 Arie’s really an old fashion hotelier who seems to have a calling for hospitality. But for years he’s also been figuring how to overcome any number of hurdles to make this place green. He’s had to become an expert in what might seem to be mundane trivia like how to combine the best non-phosphate laundry detergent with fabric softner, because he says, “You know conditioners and whiteners don’t mix.” He’s not one to give up easily. He’s found a powered detergent that seems to do the trick. Who would have guessed such little things would make a big impact. After another break for Arie to greet new guests, he explains the complicated procedures of saving water by recycling and reusing every little drop, even drip water, and using it multiple times. He talks about changing incandescent bulbs at the inn with LEDs. This is not a cheap process; some cost as much as $13 a piece. Nor is he content to stick with the cold-feeling blue-light bulbs, now known to be missing the warm yellows of the light spectrum. The good ones are a bit more expensive, but he found them. On the bright side he says, the new bulbs last longer and he doesn’t have to walk around with the ladder as much as he used to. The light at the Cobalt Inn is warm and saturated, just like the sea and the overall feel of the place. Changing light bulbs seems like a small step, but together, his small steps constitute a considerable lowering of energy use. 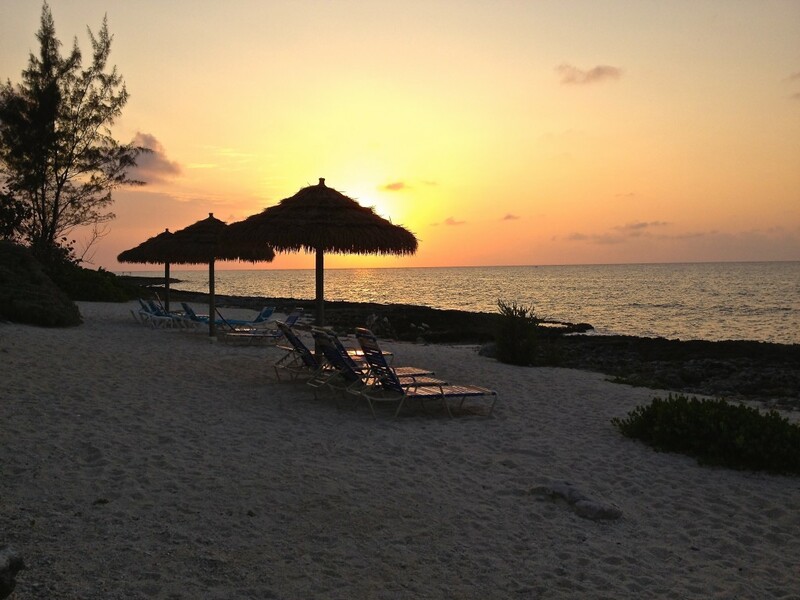 Of course he is well aware that the shallow reefs of the Cayman Islands are particularly susceptible to the bleaching that comes with warmer water temperatures cause by climate change. At times he does get discouraged about the problem of endless waste, but he usually finds a way to deal with it. Take for example paper recycling—there is none on the island, yet. He knows how much ink is in a phonebook and how toxic it can be, so he’s found a repurposing for old books and other paper by taking them to the local animal shelter where they are used again. I complain that the website doesn’t have any information about the award, and maybe it needs an update. But he’s a graceful European not given to boasting. He’s concerned with other things. Every detail of this cozy, ecoldge has been carefully planned, from the architectural design of the intimate 2-story structure with huge windows, to the imported Finish textiles that decorate the rooms. 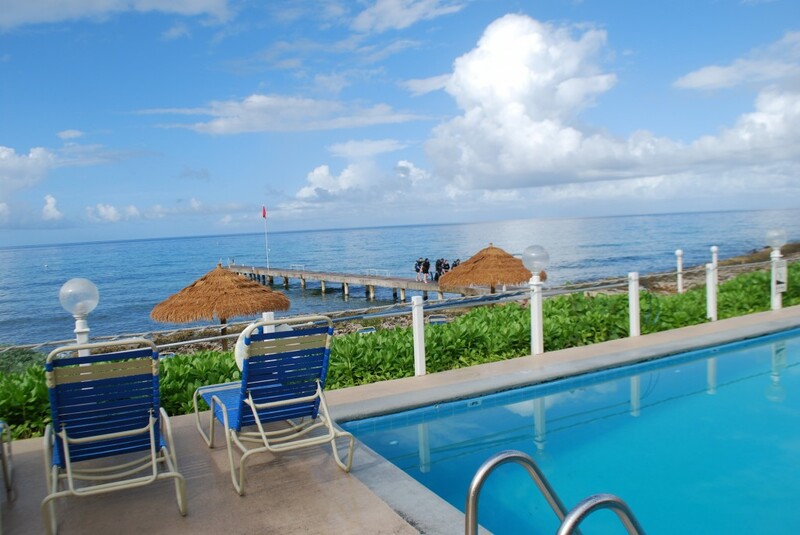 Accommodations such as these with the upscale resort feel attract a wide range of clients and about a third of the guests are non-divers. 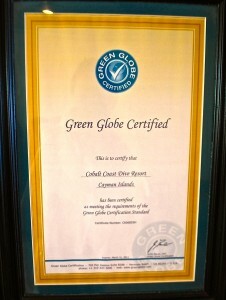 As a Green Globe certified lodge, it is also a favorite of international travelers of the green persuasion. I grill him on his many names given for the Cobalt Coast—an inn, a hotel an ecolodge, a resort, and tell him in my overconfident way, that he’s diluting his brand. I ask if he’s thought of settling on one description, but he gives me his knowing grin and shrugs. He cares little for such marketing nonsense. He knows what it takes to make it all come together in unconventional ways. 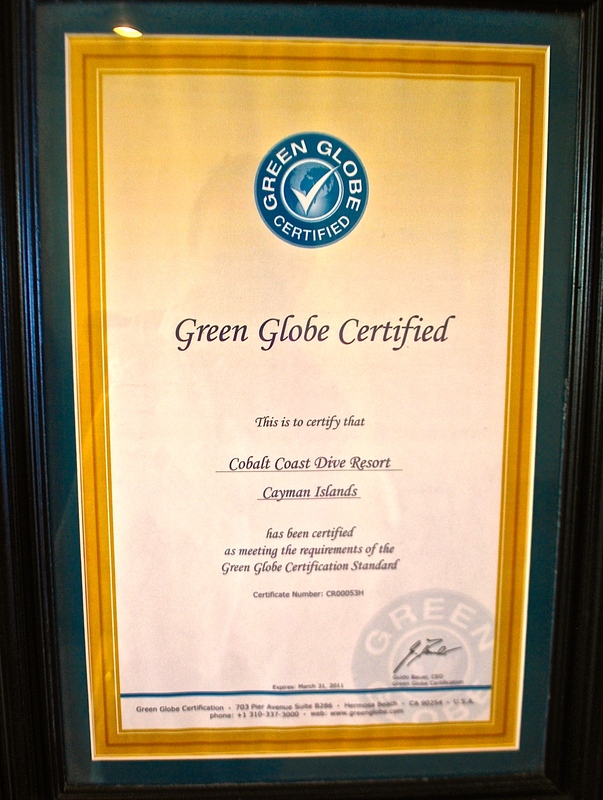 After all, if he stuck to conventional ways he never would have tried, or succeeded, in passing the stringent certification standards required by Green Globe, something other have tried and failed to do. Arie wrote the book on green, or at least he put it together in a large green binder. This entry was posted in Caribbean, conservation, eco-adventure, ecolodge, environment, green travel, nature, restaurant, Sustainable Travel, travel, Uncategorized and tagged Caribbean, diving, Ecolodge by Robin Andersen. Bookmark the permalink.